The StoColor X-Black paint has enabled a highly unusual black finish to be achieved for rendered areas of the school, so that the building’s predominantly monochrome design brief could be brought to life. The Discovery School is the first industry-driven technical establishment of its kind, and specialises in teaching STEM subjects - science, technology, engineering and maths - to A-level standard. 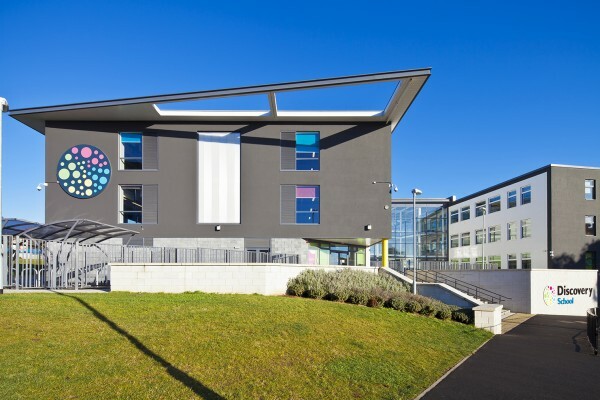 “Given the nature of the school it’s very fitting that StoColor X-black was used, as it’s a very advanced paint that allows dark colour render finishes to be created that would not be possible using conventional alternatives,” comments Sto’s Regional Sales Manager, Pete Bishop. Adding a very dark render finish over external wall insulation has traditionally been impossible, due to the heat build-up in the render from solar gain, which can subject the render and insulation to temperatures of up to 80°C. “The render absorbs heat and that can cause dimensional instability, cracking and even damage some forms of insulation,” explains Pete. The StoTherm Mineral external insulation system used on this project is based on highly durable mineral fibre boards which provide unrivalled fire protection. It offers an efficient single-leaf construction solution that provides excellent thermal performance without reducing the interior space of the building. Before the StoColor X-black paint was applied, the insulation was protected with a mesh reinforced render undercoat with a Stolit decorative finish. Made from a carefully balanced formulation of high quality components, Stolit offers an outstanding combination of excellent adhesion to the substrate, extremely low water absorption, and a high degree of flexibility which provides exceptional resistance to mechanical damage from thermal stresses.